I’m Michel Montecrossa. Me and my band invite you to our “Happy Future & Climate Change Concert Tour 2010”. We sing you all our new positive action and love-power songs. They are our happy answer to the climate change trouble surrounding us. Be happy and be part of our happy future. Let’s be together. Be part of the happy future. The DreamSpace Electronica Music Festival in Mirapuri, Italy was founded by Cybermusician Michel Montecrossa in 2010, supported by Filmaur Multimedia, Mira Sound Germany and the Omnidiet Resort and Business Hotel. The DreamSpace Electronica Music Festival takes place every year at the end of August in Mirapuri-Coiromonte, Italy at the Omnidiet Hotel and is open for all international electronica musicians and all styles of electronica music. The DreamSpace Electronica Music Festival presents future-oriented creativity of the 21st century music culture in the artistic and consciousness-expanding environment of Mirapuri, the City of Peace and Futureman in Europe, Italy. The DreamSpace Electronica Music Festival in Mirapuri is one of the most outstanding european music events for musicians and fans of all progressive styles of 21st century electronica music with a unique atmosphere of peace, joy and intelligent communication. 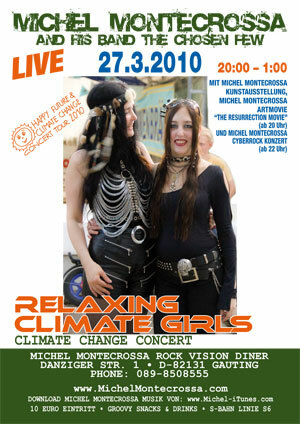 Programm: Live-Konzerte von Michel Montecrossa & his band The Chosen Few und internationale DJs / Bands aus dem Elektronika-Bereich. The Spirit of Woodstock Festival in Mirapuri, Italy (30.07. – 8.08.2010) www.SpiritOfWoodstockFest.com is the leading European Festival of the Free-Music Revolution with free camping & free entrance and friendly prices for food, drinks and hotel-accomodation. The Spirit of Woodstock Festival is combined with the hearty feastin’ and drinkin’ flavour of Mirapuri’s one and only original Bavarian Oktoberfest in Italy as well as the love Flowerpower-Happening of the Mirapuri Rainbow Gathering. The Spirit of Woodstock Festival in Mirapuri offers to visitors and participants great multicultural entertainment with international flair and an inimitable atmosphere of Love and Joy. Das ‘Spirit of Woodstock Festival 2010′ (vom 30.07. – 8.08.2010) www.SpiritOfWoodstockFest.com in Italien (Mirapuri-Coiromonte) ist das führende Europäische Festival der Free Music Revolution und bietet 10 Tage Live-Konzerte internationaler Bands & freien Eintritt & kostenlos zelten & freundschaftliche Preise für Getränke, Essen und Unterkunft. Es findet gleichzeitig mit ‘Mirapuri’s Original Bayerischem Oktoberfest in Italien’ und dem Love Flowerpower-Happening ‘Mirapuri Rainbow Gathering’ statt. Man kann direkt am Festival-Gelände oder beim ‘Mirapuri Rainbow Gathering’ zelten; Selbstversorgung über Lebensmittelladen vor Ort.